DARPA's Space Surveillance Telescope may head to Australia to search the skies for space junk that threatens U.S. military satellites. A U.S. telescope will hunt for space junk in the skies above Australia under a new defense agreement. The Space Surveillance Telescope is capable of scanning an area of space the size of the United States in seconds as it searches for small space debris that may threaten military satellites in orbit. "We value the partnership with Australia that allows us to widen our space situational awareness and share some of our revolutionary technology advances in space surveillance," said Travis Blake, program manager for the U.S. Defense Advanced Research Projects Agency, which built the telescope. "This technology development effort could benefit both nations as we catalogue and detect entire sets of currently uncharted objects that are in geosynchronous orbit above Australia." DARPA's agreement with Australia's Department of Defense will allow the 180,000-pound telescope — weighing as much as 41 mid-size SUVs — to be transported Down Under to discover and catalog previously unseen space debris. It is the latest in a series of U.S.-Australian agreements to keep watch on dangers in space. 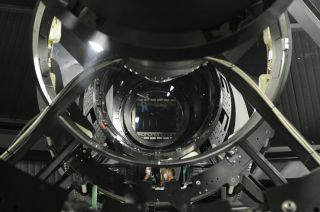 The telescope has tracked small objects in geosynchronous orbits about 22,000 miles high since being completed in 2011. Its sensitive gaze could detect a small laser pointer shining on top of New York City's Empire State Building from as far away as Miami. Data from the Space Surveillance Telescope will feed into the U.S. Air Force's Space Surveillance Network — a network consisting of 29 space surveillance radar, telescopes and sensors designed to track possible near-term collisions with satellites or spacecraft. NASA will also get a chance to examine the telescope's data for signs of small asteroids. But the Air Force network can track only 30,000 of the 500,000 space objects orbiting the Earth. The huge challenge has compelled DARPA to enlist a worldwide network of amateur astronomers in its new SpaceView program as part of the hunt for space junk.